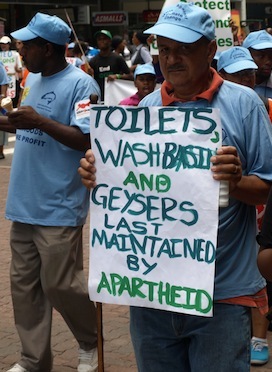 ‘Toilets, washbasins and geysers last maintained by apartheid.’ Protester in Durban, December 2011. ©David Le Page. Since the tragic massacre at Marikana, there’s been increasing discussion of the problem of South Africa’s terrifying inequality. But commentators and government representatives get rather shy when it comes to talking about real solutions. They take refuge in calls for ‘solidarity’, ‘symbolic steps’, ‘dialogue’ and, as ever, ‘poverty reduction’. These calls are at best timid and ignorant of the real nature of inequality, and at worst, evasive. Eight thousand kilometres from Nkandla, the Uruguayan president, Jose Mujica, eschews his official residence for his wife’s shabby old farmhouse, and gives a large portion of his salary to the poor. That’s real solidarity. But since we’re not yet seeing that kind of solidarity here, let’s talk frankly about two things: Firstly, the ways in which the very existence of excessive wealth actually creates poverty, and secondly, what some real solutions might look like.